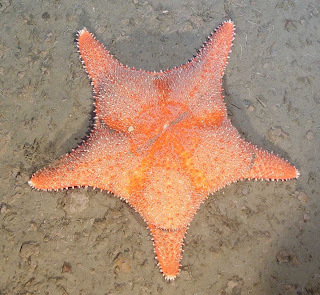 Seastars!!! Ruuuuuuun. Oops. Can't. I'm a coral. Oh yeah, Chris, my man. 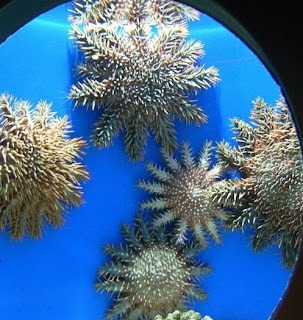 Now that there's some good Coral Week blogging. 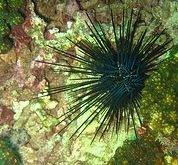 Echinoderm eats coral... kind of a story. 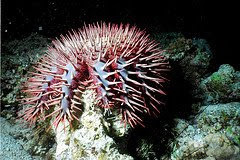 But, coral eats echinoderm ... now THAT'S news. 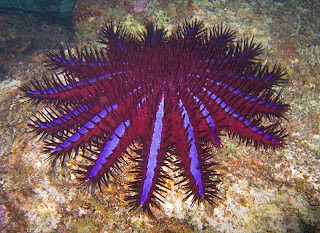 Hello dear Ph Mah, I love the echinoblog!! !, but I think the image is Diadema mexicanum -not Diadema antillarum-, because the benthic cover in the photo reminds me the Pacific landscape where I work. I´m wrong? I've studied Culcita spp. for many years paying particular attention to their eating habits. Yes they eat corals (mostly small Acropora and Pocillopora) when they are available, but more often then not they eat algae, sponges, tunicates etc, which is to say they eat organisms that compete with corals for space. 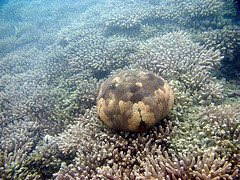 This is especially so when corals are scarce, so arguably they contribute to coral recovery after coral mass mortality. I have ample evidence to support my contentions.